*Sized @ 1600 x 900 to fit 15mb limit. *I made a few changes to this theme, so it strictly features official artwork from the GTA 5 campaign. *I resized some panels and changed the angle of the theme slightly. 1 sound (optionmenu) – a condensed version of the sounds heard during the R* logo sequence at the start of the game. *This version is sized @ 1820 x 1024. *Made from 32 official artworks from GTA 5. This theme was posted by PS3 Themes on July 14, 2014 at 2:00 pm, and is filed under Gaming, Slideshow Themes.You can leave a response or trackback from your own site. Probably my favorite theme ever. Im gonna need one like this for all my games. lol… Seriously. Incredible work. My wife even loves it. (Borderlands series official wallpapers)+(@DemiGod7 icons of BL2 theme)+(That comic background from this theme)= mind blown. I added you man. @Sephiroth__23 > I generally work with official artwork because there’s usually a theme involved (like Arkham City with the black & white pics). It makes the theme look professionally made and that’s what I aim for. I’ve got a few things going on as far as themes, but I’ll try to make a San Andreas version for you. It looks like the PS4 may support some kind of theme making (at the very least a background change) but probably nothing as sophisticated as what we have now. The PS4 does have dynamic elements in the interface though. uLtRaMa6nEt1c, you are a genius, i haven’t been around in a while, so i came by to check out the new themes, and i find this masterpiece. GTA series is the games that made me fall in love with gaming again as a teen. This is my favorite new theme, it suits these games perfectly, i mean the cover art was literally identical to this style of theme. San Andreas was my favorite in the series so far, but i know that’s going to change in a week. I really want to say thanks for making this theme . If you ever find the time would you be able to make a San Andreas theme with this style please? One more thing, does anyone know if PS4 will have themes of some kind? It’s Sly Cooper(commented below) I just changed the name. Btw know that i have been downloading themes from this site since 2008 but never registered. That changed when i installed 4-5 themes, including this one which are a compliment for this site, and deserve to be given applauding comments to their creators. i would love to see wallpapers from all 3 games including the upcoming Arkham Origins. In my opinion the official promoting artwork is much better in a theme. @Sephiroth__23 > Would you like me to use the black and white promo pics from Arkham City, or in-game screenshots from both games? got an idea/request my friend! Do you think you can make a comic book like theme of arkham series using a background like this theme? @uLtRaMa6nEt1c & everyone: Hey, guys! Since GTA V release is around the corner, well… you absolutely have to look at this… it’s f***ing funny! LOL! Longtime Grand Theft Auto addict here. This is sick!!! Great theme. Good to see you are getting plenty of love for this awesome piece of work. hahaha I was right! Your theme is the second in “Popular Now”. = ) @uLtRaMa6nEt1c Awesome Slideshow Theme even though it looks pretty clever anyways keep up the good work. 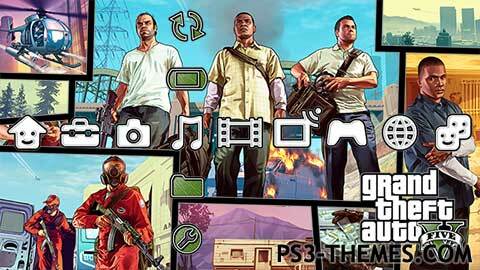 I like the style of this theme and the icons are just perfect with this theme and GTA V. Great job, +1. This is better than most official themes out there. @ss77 & IceDragon1017 > Thanks guys . If actions could be put into words. Check out the Ultra Slideshow Tutorial in the forum. This is brilliant! Super cool!